Paul the Apostle was on a sea journey from Caesarea (in today’s Israel) to Rome in the year 59 to appear in front of a court there, when he was shipwrecked and managed to get to safety on the island of Malta. 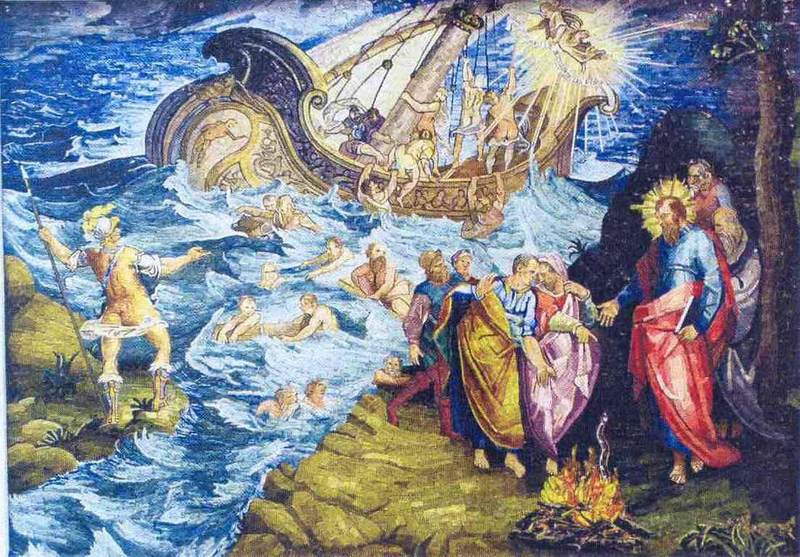 A mosaic about St Paul's rescue on Malta, inspired by a fresco in the Vatican by Nicolò Circignani and given to Malta by Pope Benedict XVI. And when they were escaped, then they knew that the island was called Melita [=Malta]. And the barbarous people showed us no little kindness: for they kindled a fire, and received us every one, because of the present rain, and because of the cold. It’s not because of the description of the Maltese as “barbarians” – which means “people who don’t speak Greek” and thus includes myself – that I am reminded of this passage from time to time, but it is the ever-recurring discussion in Malta about refugees. We’ve been saying for a long time that Malta is full up. Now the figures prove us right. What is the EU going to do to stop the influx? We need a robust Frontex with the means to push back the boats. The world has gone completely crazy with this political correctness and allowing a group of fanatics to play the race card. Malta does not need these illegals from Africa, they are just a burden on our welfare system, nobody asked them to come over. If they feel they are being discriminated against then they should have thought it before making the illegal crossing. Malta was very much at peace and was a serene place before this invasion of illegals from Africa started crossing from Libya. The following commentator seems to take his view more from verse 4 than verse 2 of the above, assuming that all refugees are criminals. Shame on our authorities who bow to EU dictatorium, ending tarnishing our island with drug dealers / prostitution / robbers and street roamers. These enormous influx of illegal immigrants seeking asylum, with only a minority (5%) given the status of refugees, have led to the situation where many Maltese people are seeing this as an invasion. I am totally against racism, however we have to STOP this illegal immigration immediately. "Thank God I wasn't black." These are not comments that people make in a bar or among friends, these are comments that people leave on a website of a newspaper, signed with their names. I shudder at the thought of what these people utter in private. Blogs, not least this one, have experienced similar xenophobic rants, culminating in an anonymous phone call with racist slurs. I wish to point out that on the other hand a considerable number of Maltese care about those less fortunate and are aware of and concerned about the wide-spread xenophobia and racism on this island. I wonder how Saint Paul would be welcomed today in Malta if he were on one of those ships in distress in the Mediterranean. This entry was posted in History, Human Rights, Malta, Politics, Religion and tagged asylum, immigration, refugees. Bookmark the permalink. 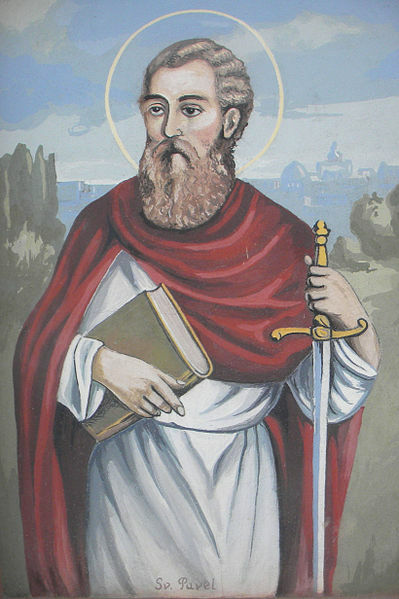 If I remember my Acts of the Apostles correctly, I believe St. Paul arrived on the island of Malta and stayed only for a while before going to Rome. I do not think that St. Paul had any intention to immigrate to Malta – the storm brought him there and then he went on his merry way. You remember that correctly. He continued to Rome the year after arriving in Malta. Not so different from most refugees who arrive in Malta, they just end up here because Malta is halfway between Africa and the European mainland. They much rather continue to the continent. What you have failed to mention is that St.Peter was a ROMAN who happened to shipwreck on his way back to his country ROME, before execution. Although you were quoting, the quote was misinforming; it is not 5% which get refugee status in Malta, but more than 50% in fact.. This is due to the fact that the government left the refugee status decisions in the hands of Jesuits, instead of appointed officials. Finally I would like to urge people to realise that this is polite ethnic cleansing. There is no war or genocide. These people are intentionally coming to Europe instead of other African neighbouring countries in which there are no wars. If you intend to produce journalism on illegal immigration, I suggest giving confidential private interviews with workers of the civil service (police and soldiers) as they are the ones that can tell you what they have to face everyday. Being a small country, every maltese person has a relative who is a civil servant and everyone can hear these stories, but our media, as in everywhere, is ‘controlled’ by the usual sensationalists and pseudo-religious people. I hope i shed some light. So why do they not let them go on to the mainland may I ask? After all Malta is a very small and crowded place – can’t imagine that a place like that needs more people. In fact, this was done with the first refugees that dropped on Malta, something for which the EU berated us and the Italians were very angry with us, hence now we have to keep them. I’m not sure which part of the world you come form Lilian Smith, but Malta has been made to become the gateway to the EU for these illegal immigrants, so you will excuse us if patience runs short when our population increases by 0.5% every year just with illegal immigrants alone! Stefan, so why does Malta abide by regulations that obviously go against the national interest? No country should. I was reading about the origins of the EU (the Treaty of Rome) and could it be that Malta is being punished for its role against the Nazis in WW11 by being turned into a giant depot and holding tank of these Africans? After all if anyone does any sort of real historical research, one soon discovers that the seeds of the EU were sown by top ranking Nazis in 1944 when they began to realize that the war was unwinable militarily. Malta does not “abide by regulations that … go against the national interest”, but it abides by regulations hat Malta itself has signed up to. An no, Malta is not “being punished for … World War II”. Malta joined the EU in 2004 after a majority of the Maltese voted in favour of joining the EU. That was 60 years after World War II. More of of your silly conspiracy theories, no surprise there. Andreas it is easy to dismiss someone with the cover all catch phrase of ‘conspiracy theorist’. Simply dismissing facts that you do not agree with does not make them any less true however. As to being punished for opposing the Nazis in World War11, try telling that to the Serbians, who were anti-Nazis and have been duly punished for it. Wow. A new history-distorting conspiracy theory. But Andreas, while both sides in this conflict committed atrocities, you cannot deny the fact that NATO came out against the Serbs and in favour of the KLA and helped to create the state of Kosovo. Kosovo is now a hotbed for the trafficking of arms and women for sexual slavery. More alarming of all is that NATO has helped create Islamic terrorist training camps right in the heart of Europe. Lilian, Malta technically has to abide by the regulations that go through, however it is one of the more vociferous (also called annoying and whining) debater against regulations they do not agree with – as shown by the long list of allowances they negotiated at the beginning. It is not “the EU”, but EC regulation 343/2003 (“Dublin II regulation”) which was already published (if not yet in effect for a few days) when Malta held its referendum about joining the EU on 8 March 2003 and which was already in effect when Malta joined the EU in January 2004. New member states accept the “acquis communautaire”, the existing laws and regulations of the EU upon their entry. Malta has not “been made to become the gateway to the EU”, but it is an island in the middle of the Mediterranean Sea, so obviously it will receive more boat people from Africa than Austria or Latvia will. Malta also benefits hugely from this location through its trade and shipping industry and tourism. Andreas, one thing does not change though, whether we joined the EU and accepted its international laws and regulations or not (I voted in favour for various reasons), is Malta’s size. 316km squared, no more no less, and population density of more than 1300 per km squared. Maybe the EU is willing to invest the money to enlarge our land area so we can hold more illegal immigrants whilst they slowly debate whether they are refugee or economic migrants and where and how to place them? Lampedusa is also an island in the Mediterranean which actually receives more illegal immigrants than Malta, with the difference that most of them are transferred to mainland Italy – thus mainland Europe – mission done, they escape and start their new life. That cannot be done here – they have nowhere to run, once they are here they are stuck unless they are either repatriated or reallocated. Thoughts of Alcatraz the prison island come to mind. We did not join the EU to become the prison island of the Mediterranean. We already had trade and shipping routes here, thank you very much, and the tourism industry won’t benefit very much if this influx of illegal immigrants keeps going on. Lampedusa is different from Malta insofar that Lampedusa is not a country. It is part of Italy. The refugees moving to Italy proper from Lampedusa remain in the same country. If Malta was part of Italy, the refugees could be sent on to Bari, Napoli, Roma and Milano. Does Malta want that? Probably not. Andreas this is just hair-splitting. What is the difference between the EU and its Regulations? The EU is nothing but regulations designed to implement its policies. And just to say because the ‘regulation’ says so or because it is the EU law does not cut it because laws are made by people to suit their agendas and can be made or unmade just as quickly by the stroke of a pen. Therefore the fact that not only they do not but instead enforce them rigidly shows that there was never any honest intent to these EU laws, regulations and treaties. And since when has it been mandated that nations that are marginally better off then another are obliged to share or cede their resources to others? Does per change the EU law also stipulate that the wealthy have to share their wealth and open their vast mansions and lands to the ordinary people who are less fortunate than themselves? Are the EU regulations also so magnanimous when it comes to the rich distributing their wealth among the less fortunate in the population? I think not. Most common people understood the EU to be a closed shop of European countries safeguarding their European identity and common interests. But instead it turn-out to be the opposite, a free for all for anyone from the third world to come and open shop there and demand welfare handouts. In other words, the European people were sold a bill of goods, and what it is now telling the people is that you had a referendum but you did not read the fine print, so therefore you are now on the hook and it is your fault. Such tactics are illegal when purchasing an insurance policy for example and it is tantamount to fraudulent misrepresentation. Also, it is evident that the national leaders who conducted these negotiations on behalf of their people were colluding with the EU by not explaining the true intent of such regulations. I can assure you had the people truly understood what EU membership really meant, not one person would have voted for it. And what is the difference between illegal immigrants that take over a small island like Malte and what the Somali pirates have been doing – seeing a ship on the high seas, boarding it and taking it over? It is the same thing and for the EU to say otherwise is hypocritical. You’ve just moved down a notch in my credibility index, Andreas. Religion apart – I mean (what a load of crap it all is). It’s so typical, isn’t it? Enforceable rules for the proles, but when it comes to bailing out sovereign nations to the benefit of German and French banks, all EU regulations get thrown out of the window. You are beginning to sound like an EU apologist. I just want to point out that blaming the EU is insincere when one has signed up to the rules in the first place or even voted in favour of them. Too many nations and politicians use the EU and other supranational or international bodies as scapegoats, even though all of these institutions exist only because sovereign nations have agreed to them and their frameworks (and decide to stay in them although they could also leave). And I just want to point out that when we signed up, we did so with the understanding that that the ECB COULD NOT bail out sovereigns or their institutions. What the hell has happened to the rule of law? Anyway, if we are to stick to the theme of the thread, personally, I couldn’t give a toss who ends up on our shores. but when migration is a result of social engineering in the so called 1st world, it makes you think (visa for vote). This is from today’s issue, see if you can remember this article and the quoted figures, and check in again in a year or two to see if anything changes. As they say: divide and conquer. Andreas, re. Lampedusa, I am not sure what your point is by repeating what I said. I know Lampedusa is part of Italy – if I may use a vulgar expression in popular culture which perfectly represents what I need to say – “Duh!”. My point is exactly that, Lampedusa can avail of the structure and resources from its parent. And once the illegal immigrants are on the mainland, then that’s it, they are in Europe, all they need to do is escape imprisonment and bob’s their uncle, they can travel around Europe and if they are resourceful enough, they may even arrive in Amberg and settle there on the streets. They would have to be highly resourceful to do that starting from here, hence a convenient prison island. By the way, I remind you that Malta was part of Italy at one point, nothing new there. Andreas – you say “I wonder how Saint Paul would be welcomed today in Malta if he were on one of those ships in distress in the Mediterranean”. 1) St Paul was no illegal immigrant. I remind you that St Paul was shipwrecked here on his way to Rome to be tried AS A ROMAN CITIZEN for preaching the new Christian message. 2) The boat was a legal Roman vessel carrying exports to Rome from North Africa. 3) Malta at the time was under the command of Rome, specifically through the install of a client king or governor of local descent – St Publius’ father, who was Maltese. Therefore the comparison is not relevant as these were Roman citizens on a Roman ship, shipwrecked on a Roman island. “In the same quarters were possessions of the chief man of the island, whose name was Publius; who received us, and lodged us THREE DAYS courteously. i.e. they left to continue for the mainland! A slight correction. Malta was a Roman municipality. This strengthens your argument further. This is the first blog that I’ve seen that is taking artistic license to the point of rude. You write as if all of Malta’s disdain for immigrants is based on colour (“Thank God I wasn’t black.”). On another note, I quite agree on the comment regarding this being an invasion and should be treated accordingly. However I would also add something that most people seem to forget – SHAME, SHAME, SHAME on the human traffickers that exploit the situation to make a profit from people’s ruined lives. If any Maltese are caught in the act or in complicity of human trafficking, they should be punished accordingly, maybe life in prison or even better expelled into the foreign country they prey on, maybe they experience the life they subject their victims to. I just read up about Emperium Europa. To me this looks like a typical manoeuvre, have you ever heard of the Reichstag Fire during World War 11 or the Hegelian Dialect? First you create the problem, then offer the solution, which happens to be just what you wanted to happen in the first place. Just follow my train of thought here Stephan. Government (by the way, we only have a two-headed ONE PARTY system right now in most countries in the West) would have used Mr. Lowell the leader (he strikes me as a Mussolini wannbe but who he really hates are the Jews like a typical Nazi but uses the Blacks as the targets). His speeches are very theatrical and over-the-top but he was very useful to Government who wanted to implement the Global directive of introducing Multiculturalism thereby destroying nationhood, even in such a tiny island as Malta. Because of his ranting, anti-hate speech laws were quickly enacted in your country thus stifling any opposition and even discussion on the merits and debits of unchecked immigration and Multiculturalism before it even started. In short, Emperium Europa was a front used by Government to gag free speech. Those who had legitimate arguments never saw the light of day because of what Emperium did. Public discussions did not happen because everyone was afraid of being accused of being labelled a racist and taken to Court? Am I right about this? Of course the rank and file of useful idiots at Emperium probably do not have a clue that they had been used in that way. This type of thing happens all the time. You have to be careful not to take everything at face value – we are living in evil times and these people are devious. Want another clue that the EU are Nazis? Then why do they hate Israel so much? The only Democracy in the Middle East and they support those that commit terrorism and the Palestinians can do not wrong.